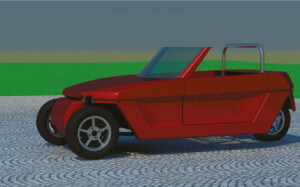 The Bulgarian company SOLARLAB OOD has started the implementation of project BG161PO003-1.1.05-0254-C0001 „Development of a demonstration model of a modular electric car with the financial support of Development of the Competitiveness of the Bulgarian Economy 2007-2013 Operation Program, co-financed by the European Union and the national budget of Bulgaria, in particular the European Regional Development Fund within the framework of operation 1.1.1. Support to innovative starting enterprises. . The aim of the SOLARLAB OOD team is to create an innovative modular car, wholly driven by electricity. The company has chosen a different approach from the current conventional production practices. The modular car is highly competitive because it is autonomous and easy to service. The construction allows non-specialists to be able to repair the car, assemble and disassemble it, as well as to combine different modules, thus changing the use of the car. So the car can be easily adapted to the particular needs of the user by changing only one or several modules and not the whole construction. This will not affect the flexibility, horsepower or any other performance features of the vehicle. The concept allows the design to be done with an open code for further development. The car can be modified for special purpose transport in closed and semi-open spaces; production and public enterprises; hospitals; sanatoriums; holiday and tourist villages; postal and courier purposes; airports; stations; underground stations; warehouses; large stores; schools; universities; sports halls; trade fair halls. In short, it can be used in any space where 100% ecologic transport is required to provide for a modern living and working environment. Our objective is to develop high efficiency vehicles with modular design, made of light composite materials, driven by lithium-ion batteries, supercapacitors, hub electric motors and hydrogen fuel cell. The first model will be optimised for local use within an area of 200 km with electricity and hydrogen charging stations in a radius of 50 km. The charging stations will provide conditions for the establishment of autonomous markets, and gradually a larger national infrastructure as well as concomitant production activities. In the beginning, the production of the vehicles will be in a smaller scale with shared production and financial means. The cars will be made in small factories up to 100 cars annually, but their production will lead to the development of other concomitant innovative production fields. It will become possible to establish the production of polymer electrolyte membranes for chemical carbon fibers and water electrolysers, the production of chemical carbon fibers and composites, which are of worldwide interest. 50% of the world production of chemical carbon fibers is concentrated in Japan, and the USA use 60% of the world production. The establishment of such production fields through independent companies or broadening the property of SOLARLAB will ensure an additional potential for innovation.